The Honourable Louis-Philippe Brodeur, P.C. View image details of the Hon. Louis-Philippe Brodeur, P.C. Louis-Philippe Brodeur was born in Beloeil, Canada East (Quebec), on August 21, 1862. He was the son of Toussaint Brodeur and Justine Lambert. After graduating from the Séminaire de Saint-Hyacinthe, he attended Laval University in Montreal and obtained an LL.B. in 1884. Called to the bar later that year, he settled in Montreal and worked with Honoré Mercier before establishing the law firm of Dandurand et Brodeur. In 1891 he was elected to the House of Commons. He was a member of Parliament for 20 years, and held the positions of Speaker of the House, Minister of Inland Revenue, Minister of Marine and Fisheries, and Minister of Naval Service. In the latter capacity, he introduced a bill to create a Canadian navy in 1910. On August 11, 1911, he was appointed to the Supreme Court of Canada. He served on the Court for 12 years, resigning on October 10, 1923 to succeed Sir Charles Fitzpatrick as Lieutenant-Governor of Quebec. 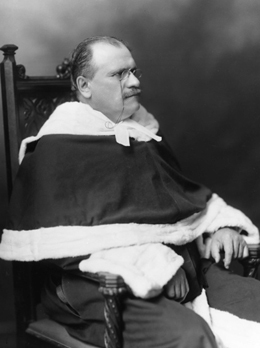 Justice Brodeur died on January 2, 1924, at the age of 61.